JAMES H. NALER, born June 1, 1951, in Hot Springs, Arkansas. His parents were Lawson H. Naler and Georgiana F. Naler, who both predeceased Jim. Jim had two brothers, Jerry, who died in 2008 and Tom, who lives with his wife, Cathy, in Frisco, Texas. Jim traveled the world with his family as the son of his Army officer dad settling in Fort Worth, Texas, where his dad retired in 1961. Jim received his Bachelor’s Degree from the University of Texas, Austin and returned to Fort Worth where he had several business ventures. In the mid-1980’s, Jim arrived in Alpine and never left. He worked for several businesses in Alpine as well as handling much work as an independent contractor. Jim is survived by his nephew, Lt. Col. Chris Naler (USMC) and his wife and family, and by his niece, Hillary Vessey, and her husband and family. Jim is also survived by three step-brothers and a step-sister and their children who knew him as Uncle Jim. Jim lived life to the fullest. Those who knew him best realize that he never dodged any issue. He could discuss any subject and would and could argue which ever side of an issue needed his support. However, it was Jim’s unshakable humor that all of us will remember. Jim was never shy about poking fun at himself and he had a keen eye for political and social debate. Jim worked hard every day of his short life. His work ethic was unwavering. His honesty unquestioned. Besides his family, Jim leaves behind a legion of friends that stretch from his Alpine home to cities and states far and wide. Besides his family and his friends, as well as his dog, Little, Jims’ greatest love was his golf game. His favorite time was spent with his good friend, A.G. Hayes, at the legendary Alpine Golf Club. Carey Blackwell shared the news with us about Jim's passing. Jim's brother, Tom, spoke about the Memorial Service held in Alpine and other wonderful stories, memories & "Jimisms." I believe Jim would want us to include this great photo of him with his dear friend of 50+ years ...Carey Blackwell. I knew Jim all the way back to Westcliff Elementary. He was one of the funniest people I ever met. I remember him faking a trip at high school graduation right in front of all the administration!! You will be missed. Writing a tribute for your best friend of 50 years takes effort not to get too long-winded, so bear with me. Jim moved to Ft. Worth from Japan at age 10 in 1961, when we met in fifth grade at Westcliff and became fast friends. With his Bryl-Creamed hair and black hornrims, I think some kids actually wondered if he was Japanese. Though not everyone accepted this newcomer from a foreign land, we clicked and I was soon aware of his already outrageous sense of humor. To this day I can recall off-the-cuff outbursts of his that put me on the floor in 1961, and the unique creativity of his humor never let up all his life. He could have been a millionaire by becoming a stand-up comic. And his great heart matched the depth of his humor. My Mom figuratively adopted Jim early in the Westcliff years, inviting him to hang out at the house during summer when school was out, having dinner with us in the evenings, being part of our family. He once asked her at the grocery store what color the water would be from the drinking fountain with the "Colored" sign. He never forgot her kindness and called her once or twice a year right up to the end of both their lives, thanking her in the midst of making her laugh over and over. 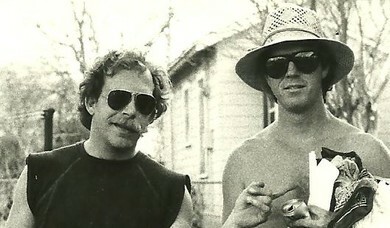 Around 1990, Jim moved to Alpine, TX. and found his bit of paradise, out of big city life, in the serenity of the Davis Mountains and a stone's throw from Big Bend. He maintained his admirable work ethic there, tempered with his favorite pastime on the links at Alpine Country Club. We talked on the phone regularly and would laugh til the tears flowed. More than ten years later, Larry Conway and I made the drive there to visit him -- it had been way too long. We continued our regular phone calls, often crying from laughter. I never experienced such impromptu, insane humor with anyone else; it was a once-in-a-lifetime gift. Nothing or no one was sacred through the sardonic lens of Jim's all-seeing eye -- even himself. In August of 2011, a couple of months after his 60th birthday, he didn't show up for work. He had passed away suddenly at home from coronary artery blockage. A lot of friends who couldn't make the drive to Alpine decided to have an informal gathering in his memory in Ft. Worth in October. I had been there two days, staying with my mom, when she passed away at home with no warning -- and I was able to be there with her then because of Jim. In the midst of the intense losses, it took a little while to see that it was the circle of love between the three of us that allowed me to be with my mother Jo when her time came. This, after the lifetime of close friendship, above the 50 years of laughter, was Jim's greatest gift to me. Jim's creative humor was equalled by his great and caring heart, even though he liked to play the tough guy. I knew better. He would and did give the shirt off his back to a stranger. I saw it more than once. Many of our classmates have passed before Jim. It's comforting to know who's keeping them laughing in the next life. Keep up the good work, Jimbo -- you broke the mold ! First, let me start out by saying that Jim Naler should have been "Most Witty" in our senior year yearbook. No one's humor was close to his. He was a pro and was always "on." He was doing Improv before Improv became popular. Like Jim, I went to Westcliff, Wedgwood and Paschal. But I did not get to know him real well until our senior year on the golf team. 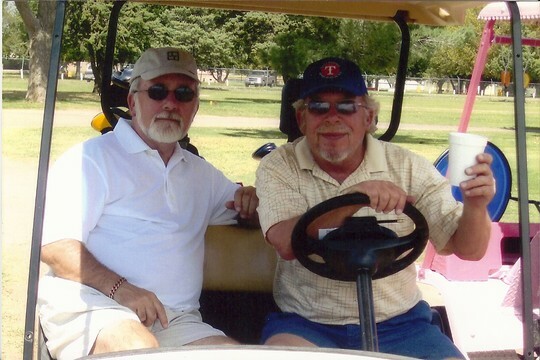 I always enjoyed playing golf with him because not only was I getting to play golf but being entertained at the same time. I admired his wit and always thought he was the coolest guy on campus. If you ever go to Second City in Chicago or Four Day Weekend in Fort Worth, you might think of Jim because he was doing that at Paschal and it was for free. Thanks Jim for all the laughs. Jim Naler will be missed by many friends. He was a great Panther and was an even greater man. Those of us how knew him were enriched by his friendship and humor.